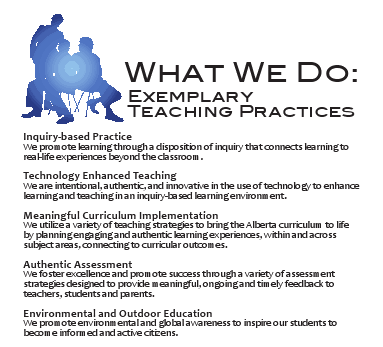 Our two grade 8 Humanities teachers, Dave Scott and Jaime Groeller, recently compiled all the materials they used for this project into an "integrated inquiry resource." If you have an iPad, iPod Touch or iPhone, you can click here to get the ePub document that contains all the steps of the project, with videos and rubrics. Thanks to all those who joined us for our first Innovation in Education "Think Tank" discussion event. Today we're holding our first Innovation and Education "think tank" discussion! This initiative is designed to get a range of educational stakeholders together to discuss emerging ideas and possibilities in education, particularly around different technologies and their implication for the classroom. We have planned our first "Innovation in Education" event for Wednesday, March 23rd, from 7:00 - 8:30pm. If you can't join us in person, you can participate in the event here. A grade 8 teacher from the Calgary Science School, David Scott, and PD/Outreach Coordinator Neil Stephenson will be the facilitators for our first event. David and Neil have become very interested the potential of digital publishing or 'etextbooks' - particularly as resource for teacher professional development. They are starting to build their first "integrated digital teaching resources" - digital documents embedded with video files, student examples and assessment resources. The dynamic, self contained, and digital nature of electronic publishing elevates it beyond paper or text based resources. In addition to providing a more interesting and visually rich platform to engage ideas, concepts, and knowledge central to a unit, digital teaching resources have the potential to provide an integrated space where current research and scholarship, the program of studies, and the lived world of the classroom intersect in one resource. David and Neil will use the resources they're working on to initiate discussion about the potential of digital publishing in education - both as student resources and teacher development material. What potential does digital publishing hold for teacher resources? How might digital resources address both content delivery and pedagogical practices? What role might digital resources play in teacher and student teacher development? We will be hosting this event both physically (at the Calgary Science School) and digitally through this link. If you have an iPad, iPhone or iPod Touch - please bring it along! 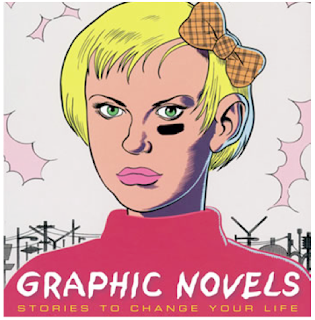 We'll be demonstrating some of the experiments we've been making with digital publishing. There's no cost for the event - although we ask that you sign up in advance by clicking here. It's open to all (parents, teachers, administrators, etc) Please spread the word about this event! 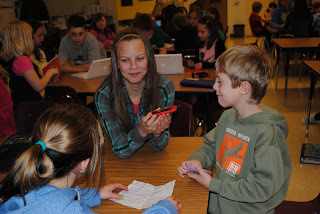 kids get excited about seeing their content in an iBook! Recently we shared some posts about a grade 6 math problem built around the question: Are there enough trees in Canada's Boreal Forest to be considered the lungs of the Earth? In order to solve this problem, students were given a few pieces of background information and worked in small groups to formulate the specific calculations they'd need to solve to answer the question. You can read about the first part of the project here. Another weekly post for our Inquiry Book study. You can get to all the posts and comments through this link. 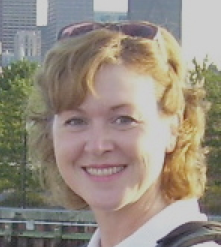 Writer: Sarah MacGregor I am a U of C grad, BGS and soon BEd, specializing in Early Childhood Education. I am passionate about inquiry and enjoy practicing on my three year old son. I'm currently in my last semester and looking forward to an exciting career in teaching. I have a sole publication to date and you can find it here. I live by the mantra, become the lesson you would teach. You can follow Sarah on twitter and read more of her ideas on her blog. I would like to start by saying that I was very hesitant to write a guest post for this book club. I am, after all, a preservice teacher with limited experience attempting to make intellectual connections with a group of very experienced, and probably outstanding, teachers. So what can I possibly offer? It’s my hope that two years of theoretical learning combined with practicum experience have left me with a strong platform upon which knowledge can be built and extended via this book club. So far, I have found that the creation of this post has deepened my learning experience and understanding of Perkins’ chapter five: Uncover the Hidden Game. I hope that my interpretations and ideas will promote further knowledge building in this group as the chapter indeed has the potential to provoke a lot of reflection. In my practicum experience in a grade one/two split, I was asked to teach the Boats and Buoyancy unit. As should be expected of a student teacher, I got very excited about this and began brainstorming exciting ways to introduce the unit. My partner teacher and I soon realized that all of my ideas involved boats sinking! Somehow I thought that boats were only really interesting when they sank; when they failed to do what they were designed to do. This is because of the interesting questions that a sinking event leads to: What went wrong? (Mechanism) Why? (Interaction Pattern, Probability) Who is responsible? (Agency) How has this impacted the lives of the people involved? 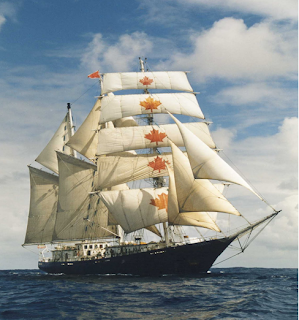 There is more complexity in a sinking event than a successful voyage. There are emotions, opportunities for heroic demonstrations, triumphs, failures, and human struggle. The excitement and epic nature of a sinking boat makes the game worth playing, as Perkins would say. To add to this, just days before the planned opening, the Canadian Class Afloat ship, Concordia, sank off the coast of Brazil. This was a GREAT story. They were students, they were Canadian (many even from our city), and they all survived because of their successful training (working on the hard parts) and courage. nd tell the class the story of the great Canadian Blue Nose. They enjoyed the story and began to take up the unit with a racing mindset. 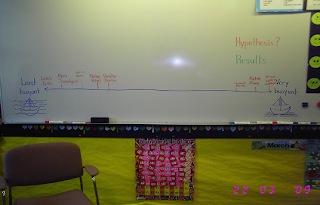 The next day we got into the Class Afloat story and the unit really took off. Over the following weeks, students worked in groups with various materials in water, referenced boat designs/types in books, drew designs for their boats (new class afloat prototypes), had their work teacher and peer edited, and then began building. When they were done we tested the boats as a class, providing group feedback on improvements and evaluating relative buoyancy. Then they had the opportunity to go back and improve their boats. In reading chapter five, I was left with the question: What is the hidden game in this unit, and did we uncover it? Throughout this learning process, students discovered the importance of shape in a boat. This happened initially in their discovery that plasticine would sink unless they changed its shape, and then later in their boat building. Shape is the mechanism by which the boat stays afloat. However the anomaly weather system that struck Concordia overcame the physical capacity of the shape to exist in its upright position. The probability of this weather system was extremely low which leads to the complexity of the interaction patterns in weather systems. The agency goes all the way back to the boat builders and the complexity of their task to combine shape with masts, sails, rudders, etc. In answering my question, no, we did not get into the complete realm of the hidden game. However, I like to think that we played a successful junior version by discovering the importance of shape. As an early childhood specialist, I had an appreciation for Perkins’ Kindergarten example in this chapter. The teacher notices her students beginning to dwell on one topic, in this case animals, and directs them to open up new ideas. This reminded me of how my class began to dwell on racing boats. The way O’Hara’s students are able to participate in this flowing dialogue speaks to her disposition and how these class experiences are regularly lived out. Furthermore, Perkins touches on the very important topic of developmentally appropriate practice. To what extent do teachers need to become experts on human development? This is a very important question in ECE in particular, where the rate of development is generally really fast (i.e. you can see massive differences between September and June in the lower grades, which are not always as apparent as you move up the grades). Perkins’ example provided me with a great model of how critical pedagogy can live in ECE. This will include a lot of junior versions, priming students for a future of intriguing ideas that they can approach with a critical, self-aware eye. Not an easy task. Perkins speaks a lot to intentional teaching in this chapter. When describing an example, he states that “the particular anomaly is calculatedly chosen to push the learners further along the dimensions of complex causality”. That is, the teacher knows where the students need to go and is intentional in guiding students toward this discovery. The discovery itself, perhaps even just by being a hidden game, leads learners toward a more universal understanding. At the very least, students will discover that hidden games exist and things are not always as they seem. In moving away from teacher-centered pedagogy, this is a crucial step because it asks students to question their own discoveries, leading to more robust understandings. As adults and teachers we can often fail to notice universal understandings that we now take for granted. They have shifted into our unconscious (tacit) knowings about the world. This is clear in Perkins’ words, “it’s easy to imagine that these sorts of distinctions are obvious, but they are certainly not”. I was intrigued by Perkins’ section on tacit knowledge. An example of this occurred this morning when my son questioned why I had to close the bag of bread. This is common sense to me. Obviously if I left the bag open the air would dry it out. So I began to try and explain this and it proved to be much more complex knowledge than I realized. Not only did he have to understand that air makes the bread dry and it doesn’t taste as good, but when I put my hand up in the air and said “air” he was looking for the thing I was referencing. Then we had to have a conversation about what air is! This leads us to a relatively difficult scientific concept (he’s three after all) that had entered the realm of my inert knowledge –or so I think. There is a complex causality for the bread drying out and this is the hidden game. Ultimately, I think that Perkins refers to a level of self-awareness in teachers to the extent that we can take on student perspectives relative to our own. With that understanding, we can guide students to more complexity. If I had planned to teach my son about this topic, I could have well predicted the difficulties he would encounter with it and scaffold the steps accordingly. Indeed I probably would have concluded this information is beyond his realm of readiness, outside his zone of proximal development, and not developmentally appropriate. So what’s the junior game of drying out bread? 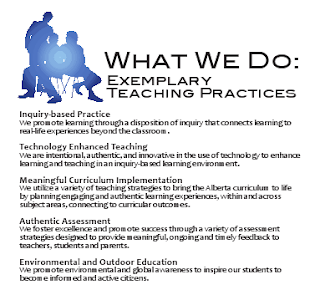 As a charter school, we have a special mandate in Alberta to provide specialized learning experiences for students in keeping with our school's vision, mission and charter as well as to share exemplary teaching practices and innovations with other schools. Although we have this common mandate, each charter school is unique. Over a period of several months beginning with our staff retreat at the beginning of the school year in August, the Calgary Science School has been reflecting on our mandate and in the spirit of inquiry, we have been exploring the question, " What does exemplary teaching and learning look like in the Calgary Science School?" Our grade 9 students recently completed a project where they were asked to take a complex idea (the Canadian Charter of Rights and Freedoms) and explain it in a short, simple and entertaining format. Our videos may surprise you. They're short and simple. They use paper cut-outs. They cover subjects "in Plain English." But lurking under the simple surface are lessons that have been crafted with great care. Despite our fun and lighthearted style, we take explanation seriously. You can find examples of Common Craft videos here. For our grade 9 students, creating a Common Craft explanation for the Canadian Charter of Rights and Freedom meant they had to take a complex idea, determine the most important components, and communicate them in a visually effective and compelling way. 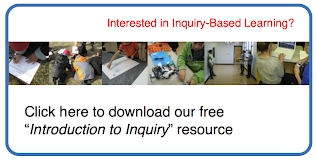 Welcome to week four of our inquiry book study - you can access the discussion from the first three weeks here. to cars wouldn't apply to trucks. Transfer is complex with many ancillary topics: near and far transfer, negative transfer, Bo Peep transfer, high-road, and low-road transfer. Teachers who can create lessons in which students excel at transfer are performing a great feat. If our lessons don't have strong cues that lead toward transfer "then the sheep do not come home" when placed in an out-of-town bin (the lost sheep theory). Last year we shared a number of posts about a grade 8 Renaissance Project where students determined whether Calgary had the necessary conditions to be considered a Renaissance City. You can read about the first year of the project here. Students felt they learned a great deal about both the Italian Renaissance and current conditions in Calgary - but would have appreciated an opportunity to re-imagine or redesign parts of Calgary based on what they discovered about Renaissance conditions. They felt they didn't get a chance to act on their findings. With that in mind, this year's Renaissance Project picked up where last year's project left off. Similar to last year, the first portion of the project was for grade 8 students to study the changes and developments that occurred during the Italian Renaissance. This year, part of this background knowledge was covered by an integrated digital resource that the teachers created for the students. This resource provided students with some introductory background knowledge supplemented with inquiry questions and links to extension videos. You can access this resource here. After discovering the conditions of the Italian Renaissance, the students then considered if the changes and developments that occurred during in Italy during the 15th and 16th century, are occurring in Calgary today. To provide direction for the study, our students were linked with Calgary experts in the areas of commerce, education, religion, science, communication, art, and culture. Each group member came up with 2-3 interview questions to ask their expert in order to determine if the changes and developments they discovered in Renaissance Italy are occuring in contemporary Calgary. This lead to a horseshoe debate. Finally, students were give the opportunity to consider how we might foster the positive qualities and characteristics of Italian Renaissance city states in contemporary Calgary. The project capped off by a Renaissance Symposium that was held at the Science School on March 2nd. This event was attended by the 100 grade 8 students, as well as dozens of local experts from a variety of different sectors. The focus of the symposium was to allow for a sharing of ideas about how might might be re-designed or re-developed to achieve a greater quality of living for our citizens. This event was kicked off by a keynote address by Dr. David Jardine, professor of Curriculum Theory from the University of Calgary. After the keynote address, students shared their ideas for a more Renaissance-like Calgary through videos, displays, and digital animations. You can see the keynote address, and examples of the student work below. You can find all the lessons, handouts and tasks by clicking here. This grade 8 example was completed for a Japan unit, part of the Grade 8 Social Studies curriculum in Alberta. This video is a powerful example of the potential for digital storytelling in the classroom - and combines research, script writing, images selection and music choice, in addition to remixing and use of green screen. At a few points through the video you'll see images where the grade 8 students have digital inserted themselves into the photographs. Shelley Robinson, PhD, is a writer, educator, researcher and mother (not necessarily in this order). “It is the function of the educator to examine deeply his own thoughts and feelings and to put aside those values which have given him security and comfort, for only then can he help his students to be self-aware and to understand their own urges and fears” (Krishnamurti, 1953, p. 38). Recently, in the educational institutions across our province, there has been considerable interest in 1) defining; 2) interpreting; 3) implementing; 4) measuring; and 5) further developing promising practice (all reciprocally) around the concept of student engagement (Inspiring Education, 2010; What Did You Do In School Today, 2009; Rocky View School Division Alberta Initiative for School Improvement Cycle 2 Research, 2003-2006). Our inquiry book study has made it to week three! Be sure to check out the conversations still happening on weeks one and two. Thanks to Allison Home for this weeks great blog post - as always - please share your thoughts and comments below! You can read Allison's blog here and you can find her on twitter here. A teaching career affords many opportunities for reflection. In fact, it is difficult to think of other careers that provide such opportunity for reflection on a daily basis, as every day is certainly unique for an educator. For some of us, it almost becomes an obsession. I spent many an hour (when I should have been marking) reviewing the latest book on increasing student involvement, or scaffolding for the reluctant reader. My bookshelf grows heavier, and alas, so does my bag of marking. Making Learning Whole fits my obsession just perfectly. In my limitless quest to find the ultimate resource for the high school Social Studies teacher, I had hoped I had found my educational equivalent of the holy grail. And to this point, it has not disappointed. Chapter Three is entitled, “Work on the Hard Parts”. Perkins suggests that we are all often guilty of “practicing your mistakes” (Perkins, 2009, p. 79). In the classroom, we know this to be true, as time and time again, we comment on an area for improvement that a student, in the very next assignment, completely ignores. For me, it is a probably most evident in essays. “Remember to include some proof that backs up this statement,” I write in the margins on an essay about the effects of imperialism. Yet on the next essay on economic globalization, the same problem rears its ugly head. Sometimes I have thought to get a number of rubber stamps with comments on them, as I seem to write the same thing over and over again. Perkins calls this the “hearts and minds theory” – we hope that the student will take our comments to heart, keep it in mind, and make the necessary changes. In doing so, we may be incorrectly assuming that the student’s heart was actually in it in the first place, or that they even understand our often brief feedback. Often the feedback is not that informative, and even when it is informative, there is no guarantee that the student will understand it. The cognitive psychologist K. Anders Ericsson suggests that truly successful individuals are often not naturally gifted; in fact, talent played a negligible role compared to deliberate practice (Ericsson, 1993). Malcolm Gladwell found similar evidence in his book, Outliers, suggesting that natural talent does not matter as much as hard work and practice. What is interesting in this is that a cognitive psychologist is involved. Cognitivism is a learning theory that focuses on how the brain accepts new information. The brain is often compared to a computer in that it accepts information, processes that information, and then outcomes are generated. Cognitivism suggests that learning occurs best when the content is broken down into smaller chunks. This seems to be the basis of Perkin’s argument as well – practice the hard parts. But how does one know what the hard parts are? Perkins spends much of Chapter Three discussing assessment, for in assessment we will be able to determine where the hard parts exist, and provide accurate and well timed feedback to students. He suggests several types of assessment – actionable assessment, peer and self-assessment, and implicit assessment. Perkins suggests that the key to working on the hard parts is to isolate and reintegrate these trouble spots – find out what the trouble is through the various assessments, isolate it and provide opportunities to try it again in the setting of the whole game. But just how do you know when the hard parts will pop up? For every teacher, I think there is an innate ability to anticipate what students will struggle with. Still, I am often surprised to find that what I had considered quite easy is posing a challenge with a class. Perkins suggests that there are different types of knowledge: ritual, inert, foreign, tacit, skilled, and conceptually difficult. For each of these types of knowledge, Perkins has suggestions on how best to attack the difficulty the students are facing (pages 89 – 99). He cautions teachers to avoid the blame game – in which all we do is sigh, shrug our shoulders, drink even more coffee, and carry on the status quo. His final advice in Chapter Three is to think about creating études – specific exercises that strengthen certain skills and sensitivities. “It’s a holistic mission with a technical agenda” (Perkins, 2009, p. 105). Andersson, K.A., Krampe, R.T., and Tesch-Romer, C. (1993). The role of deliberate practice in the acquisition of expert performance. Pyschological Review, 100(3), 363-406. Gladwell, M. (2008). Outliers. New York: Little, Brown and Company. Perkins, D. (2009). Making learning whole: how seven principles of teaching can transform education. San Francisco: Jossey-Bass.